October 16, 2018: This fall, Michael Kors is moving its store at The Dubai Mall to a new, expanded location. To celebrate the new Middle East flagship, which will showcase even more of the world of Michael Kors, the brand is introducing a special-edition Whitney handbag, to be available in Michael Kors stores across the Middle East. The Whitney, first introduced this past summer, has become the newest iconic style from MICHAEL Michael Kors. Designed as a group of 24/7, work-to-weekend bags, the Whitney combines sophisticated silhouettes with on-the-go versatility. The subtle but distinctive “M” shape on the front nods to the designer's initial, a letter he's been sketching since he was a child. Every bag also features a sleek, distinctive push-lock fastening with pyramid stud detailing. 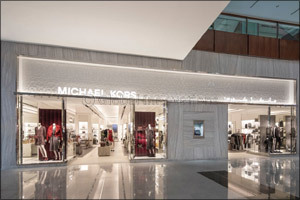 The expansion of the Michael Kors Dubai flagship will allow customers to experience an even wider assortment of products from Michael Kors, including a full range from MICHAEL Michael Kors, handbags and footwear from Michael Kors Collection and ready-to-wear and accessories from Michael Kors Mens.